The message is clear: here, the sole purpose is to awaken the desire in people to share, exchange and above all, to savor. Currently, the big names in gastronomy are obsessing over the neighborhood of Bastille: Michel Trama, Yannick Alleno, David Toutain, Akrame Benallal, Christopher Hache, Pierre Gagnaire…and as a welcome gift, they offered Thierry Monassier, the founder of Manger, a recipe to compose the menu for the “chefs’ dinner” which is available here every evening. But the originality of the place does not only have an impact on those who are present. Here, at lunch and at dinner, it’s nice to be seated at a table eating excellent food, all while helping people in situations of professional exclusion to reintegrate themselves into society by grace of jobs in the restaurant trade. As for the dishes, Thierry Monassier, who also created the Toques & Partage association, defends the use of ingredients ourced nearby and is on a mission to rehabilitate the strawberries of the Orgeval valley, the cauliflower of Aubervilliers…At the stove, William Pradeleix imagines a cuisine based on the selection of ingredients and taste, thinking about a weekly menu which, for lunch, offers dishes according to different modes of cooking. 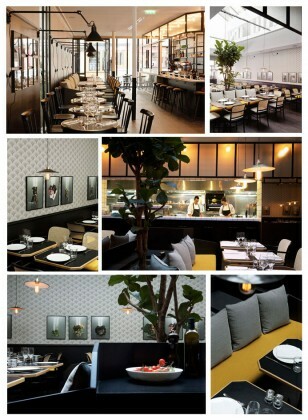 Manger is also a restaurant designed to delight the eye, courtesy of Marie Deroudilhe. A play of transparencies and contrast, combinations of marble, metal and wood, an overhead glass canopy, and vegetation that divides the space into two areas: the brasserie and its cozy bar and the gourmet restaurant around the open kitchen.